Explore, Learn, Have Fun! : Eversave Atlanta BBQ Giveaway! Have y'all joined Eversave yet? I just recently did and L.O.V.E. them!! They offer great daily Saves for businesses in many cities across the country. You can get a half price meal, a salon mani/pedi for half price, deals on travel, makeup and more. These Saves are usually only available for 24 hours. It's a nice way to try a new (or favorite) place at a really good price. It's free to join Eversave and they will even give you $2 in credits when you sign up for their daily emails! I like that the vouchers for your Save are emailed right to you ~ so convenient! 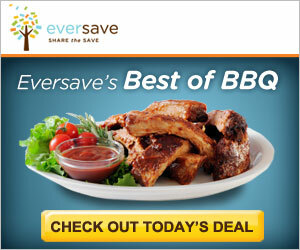 Today is Best of BBQ Day at Eversave, and they have some fabulous BBQ deals!! For all of my readers, there is a national deal from Pat Boone All-American Meats ~ $39 for $80 of premium meat delivered right to your door! And if you are new to Eversave, you'll have a $2 credit for signing up for daily emails, so you only pay $37. For my Atlanta peeps, Rick's Smokin' Pig BBQ in Gainesville has a yummy Save for you ~ $7 for $15 worth of delicious BBQ & non-alcoholic drinks. (New Eversave members will only pay $5 with their email credit!) We haven't been to Rick's yet, but it's on our side of town so we'll be trying them SOON. Their menu looks delicious! There is one entry per person. First of all, you need to be an Atlanta-area resident to win this Eversave voucher. Like Eversave Atlanta on Facebook, then follow @EversaveATL on Twitter, and of course, open a free Eversave account. After you do these three things, please leave a comment below telling me you did, and include your email address so I can contact you if you're my winner! If you don't have a Twitter account, just let me know that in your comment. Contest ends Monday night, August 15 at 11:59 pm EST. I'll draw a winner using random.org Tuesday morning, and contact them via email. The winner must respond within 24 hours, (or another winner will be drawn) and then they should receive their Eversave voucher via email within a few days. Thanks so much to Eversave Atlanta for sponsoring this fantastic giveaway! Thanks so much for stopping by, and good luck!! I just joined eversave & liked them on fb. Don't do twitter yet, only do fb because someone twisted my arm. We love BBQ. Can't wait to go to Rick's and give them a try. Sounds yummy. Follow them on fb, don't have twitter, made an eversave account too. I do love good BBQ!